Has Banksy finally designed a website? Troika is the name for a collection of three elements that once combined increase strength, stability and power. It is the power of three. And when three seasoned hospitality recruitment specialists came together to form a new, powerful recruitment company, the name ‘Troika’ was the natural choice. 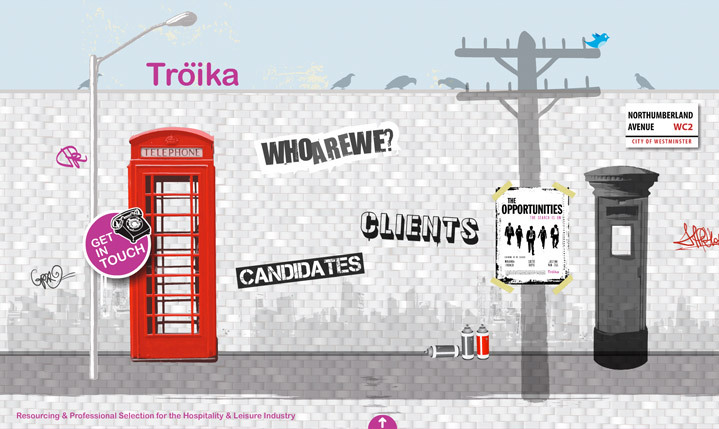 To set their offer and brand apart, the three principals of Troika Recruitment created a brief that demanded a corporate website design that was very different from those of the established, larger, more general recruitment agencies. Of course, in a heavily networked industry, ‘word on the street’ is all powerful, and it was this knowledge that inspired us to create a Banksy-inspired, graffiti streetscape that provides a truly interactive experience for the web visitor. Sounds, tools and posters all provide exciting navigation around the site, with many hidden treasures to be found now, and many more being planned for the future. All in all it’s a website that punches above its weight for a start-up business and not just another brick in the wall.